It sounds as if LSU has finally come to their senses. 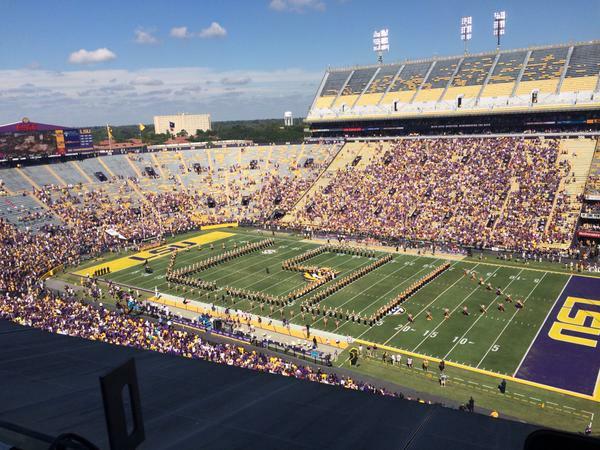 LSU announced on Wednesday it has developed a plan that will allow visiting bands to perform halftime shows on the field of Tiger Stadium. The LSU Athletic Department, the LSU Band and the LSU Office of Risk Management engaged in a collaborative effort to restore the halftime pageantry provided by visiting bands while insuring a safe environment for all. The plan involves re-configuring seating areas in the South End Zone so that visiting bands may take a more direct route to the field, reducing the congestion and safety hazards created by previous field entry methods. We understand safety is a concern and we are happy that a compromise could be made. It sounds like they are starting to understand the greater impact that marching band camaraderie can have on the game. "We have gladly made adjustments to our own halftime show to make it possible for visiting bands to perform on the field," said Damon Talley, LSU Director of Bands. "It is important that we’re able to share the field with our colleagues who want to experience the unique atmosphere that is Tiger Stadium. We enthusiastically support the university’s effort to make this happen."